Trailhead and parking area are on Hedgehog Mountain Road in Deering, NH. Take Bowen School Road from the west side of Rt. 149, 2.2 miles south of the center of Hillsboro. In 0.4 miles, reach the end of the road and turn left onto Old County Road, continue 0.1 miles, and then take the next right onto Hedgehog Mountain Road (can be very muddy in the spring). After passing by a sand pit area, there is a rock-lined parking area with a kiosk on the right side just over half a mile down the road. Hedgehog Hill is a small, ridge-like hill in southern New Hampshire. From its rocky summit is a great westerly view. The lone trail on the mountain, maintained by the Forest Society, is short, but somewhat steep in its upper section. From the parking area, walk 0.1 miles further down the road. Reach the trailhead, on the left, after crossing a bridge. Turn left and follow the Hedgehog Ridge Trail as it winds through an open forest, crossing a few small brooks. Eventually, the trail joins a snowmobile trail and follows it to the top, 0.8 miles from the parking area. Just below the summit, turn right onto a spur path as the main trail continues straight. The summit is grassy and rocky, and the view is wide and directional. 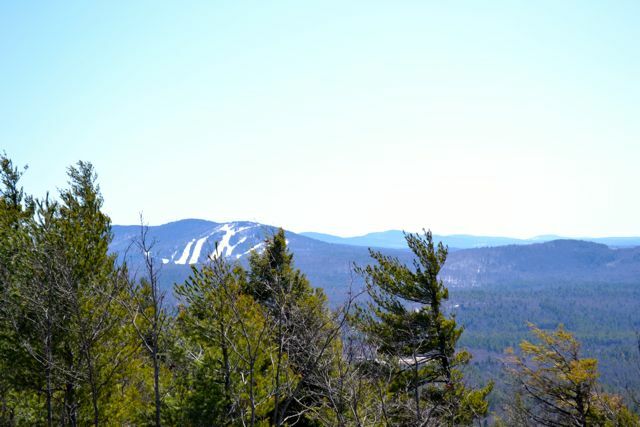 Across the small hills, some of the larger mountains in the Monadnock Region can be seen, including Mt. Monadnock itself. Walking down the huge summit ledge reveals more of the northern view.